The fun begins September 14-15 and continues through the last weekend in October. Join us on any or all Apple Days Fall Harvest Festival Weekends from September 14 through October 27 to experience the joy of fall on our farm. A must-see is our Adventure Barn, designed and decorated by our own Elaine Madigan. Each season, enjoy barn filled story of life on the farm. The Adventure Barn debuts on Apple Day and is open through the end of October. We hope you enjoy this show as much as we enjoyed creating it for you! 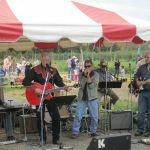 Every Saturday and Sunday during the seven fall weeks, Terhune Orchards features live music played by some of the area’s best local talent. Most bands are returning by popular demand. For a list of the performing bands, see A Month of Music on the Farm. Enjoy the music as you sample our special fall food fare. 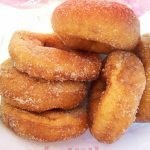 Try fresh pies, BBQ chicken, pork sandwiches, homemade salads, cider doughnuts and much more! Enjoy our fresh Terhune Orchards hot or cold cider to keep your revelers going all day long. The winery tasting room is open for a place to pause and overlook the farmyard. Enjoy a tasting or glass of of our award-winning red, white and fruit based wines. The seasonal favorite, Apple Wine, is made with our own apple cider. Fall is apple and pumpkin time on the farm. Our pumpkin patch is open for pick-your-own pumpkins. Choosing just the right one for your jack-o-lantern is often a family affair. 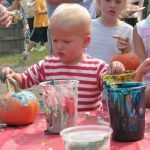 Each weekend we will have a pumpkin painting station set up for children to decorate their own pumpkins. 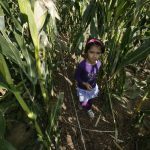 Pick-Your-Own is a fall favorite with many families. 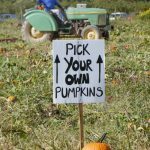 Pick-your-own pumpkins are located at the home farm on Cold Soil Road. 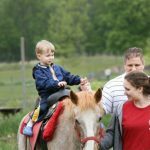 Pony rides, tractor drawn wagon rides, pumpkin painting, pedal tractors, visiting our barnyard of animals, duck races, discovery barn, the Corn Stalk Maze, Hay Bale Maze and exploring the Farm Trail are some of the delights that await you each weekend. The farmyard is loaded with a vibrant display of colorful mums, Indian corn, pumpkins and apples are perfect for pausing to take a family photo and choosing all decorations for your home. 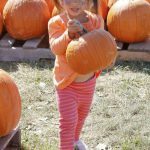 Come to Terhune Orchards every weekend this fall for great farm fun, great food and great music, celebrate the harvest with the Mount family and see your neighbors and friends. Rain or shine, 10am to 5pm. Parking at the farm. Admission fee $10 – children under 3 are free. 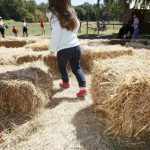 Included in $10 festival admission: music, barnyard, nature trail, adventure barn, wagon rides, pedal tractor area, discovery barn, kids games, hay bale maze, corn maze, painting pumpkins and unlimited time visiting our farm. Additional fee for some items: face painting, pony rides, pumpkins, rubber duckies and food. The Farm Store, pumpkin and mum display and our new winery and tasting room are open without admission fee. Convenient parking is available at the farm on Cold Soil Road. It’s a great place to bring your out-of-town guests and to meet your neighbors. No outside food, pets, coolers or alcohol are permitted.